Baby Base 2-in-1 Seat - Peacock Blue is rated 4.6 out of 5 by 24. Rated 5 out of 5 by Chrystal from Great baby seat I bought this for my son when he was learning to sit up to help support his back. I'm so glad I did. It really helped a lot. Also great because it was a booster seat for eating. It's easy to clean and attached easy to my kitchen chair. Once he was able to sit up good I removed the blue piece to have a bit more room. Love this little seat. Rated 3 out of 5 by Sean from Great idea just wish the back was easy to remove Just bought it because I wanted seat that was easy to travel with to bring to the babysitter. Overall I love it, I just wish the backrest could snap in and out for easy travel. It would be nice if you could store it in the base the way it was in the package. Rated 5 out of 5 by Rossie418 from My son is loving it! It’s perfect for my son not only is helping to sit up right but he’s enjoying his snack time sitting up like a big boy. It’s perfect for his weight and his size . It’s very comfortable too ! Rated 5 out of 5 by Rossie418 from My son is loving it! It's perfect for my son not only is helping to sit up right but he's enjoying his snack time sitting up like a big boy. It's perfect for his weight and his size . It's very comfortable too ! Rated 4 out of 5 by Nrhein from Easy to clean, simple storage I love this booster chair, it’s not bulky but completely sturdy. I love how easy the chair and tray are to clean as toddlers are not the cleanest eaters. I would definitely recommend to parents and even for grandparents houses that need a chair that is easy to setup and tuck away when not needed. Rated 4 out of 5 by Nrhein from Easy to clean, simple storage I love this booster chair, it's not bulky but completely sturdy. I love how easy the chair and tray are to clean as toddlers are not the cleanest eaters. I would definitely recommend to parents and even for grandparents houses that need a chair that is easy to setup and tuck away when not needed. Rated 5 out of 5 by becca9342 from Perfect Seat for Space Conscious Families If you're like me and find that the footprint of a new baby is overwhelming, then look no further with this seat. It eliminates the need for a large high chair sitting in your kitchen, it eliminates the need for an extra floor seat during those early muscle development stages and finally, as your child grows there goes the need for a booster seat at the table. 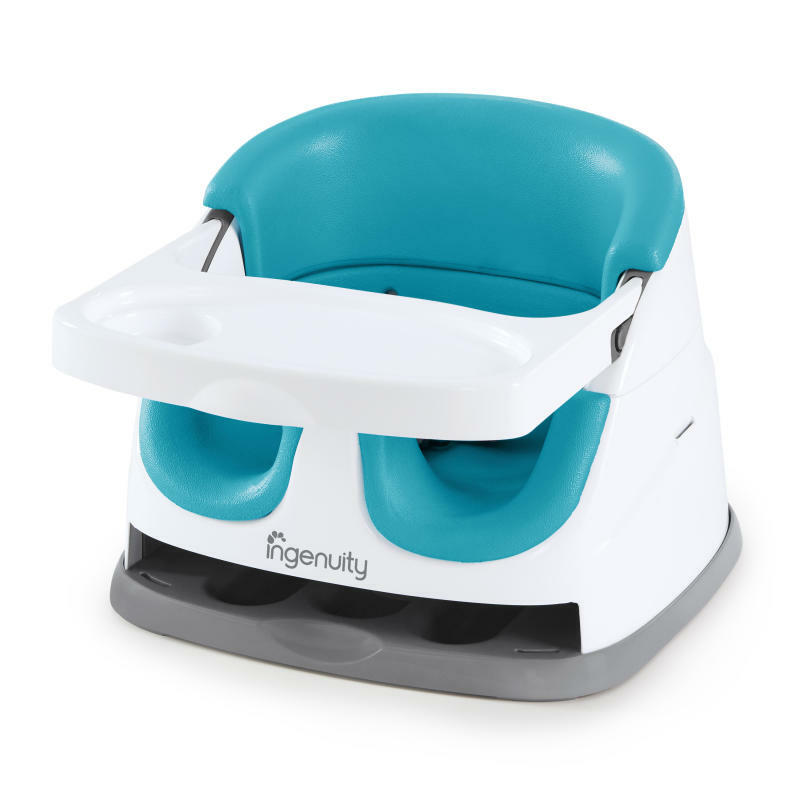 The baby inserts easily come apart to clean and sanitize, far better than any high chair I've ever seen and also make the seat roomier to grow with the child. It feels very stable while used on the floor and while strapped to a kitchen chair. I will note, as your child grows, if they intentionally wiggle around, then the seat will move/slide around while on the floor with them. My one year old can reasonably cause the chair to tip over when he's goofing around with it on the floor. So, as with any other floor seat, don't ever sit them in this type of seat on a counter or other elevated area as they can tip once their muscles get developed. With an older child, the tray is really not that practical or needed for the increased size of their appetite, but that's not a problem at all. Remove it! Then, strap the seat using the attached buckles to your kitchen chair, put a placement in front of them, and problem solved. I really don't think you can go wrong with this seat if you're looking for an economical and space-saving option that will also grow with your child.